The Sarasota County Sarasota County School Board this week authorized its staff to begin formal negotiations for the purchase of 20 acres of property on Palmer Ranch for a new elementary school. 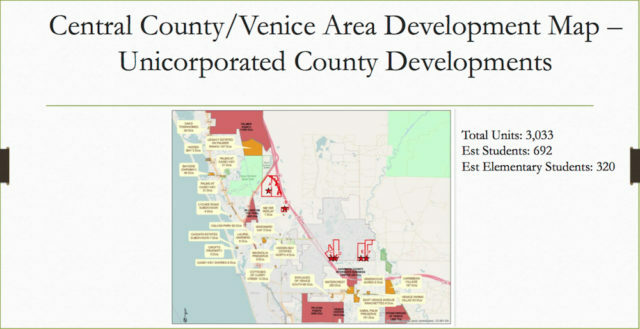 The parcel is south of State Road 681 near Venice, with easy access to Honore Avenue, Interstate 75 and U.S. 41, Kathie Ebaugh, director of planning for the school district, explained during the board’s Jan. 17 workshop in Sarasota. She added that the property owner — McCann Holdings Ltd. — already has offered the site to the School Board for $2.5 million, which is the amount the School Board had allocated in its Capital Improvement Program budget for the acquisition of land for its next elementary school. The facility will serve students who attend Ashton Elementary in Sarasota, Laurel Nokomis School in Nokomis and Garden Elementary in Venice, Ebaugh pointed out. Both Garden and Ashton “have a significant number of [portable classrooms] on their campuses,” she pointed out, illustrating that they are over capacity. 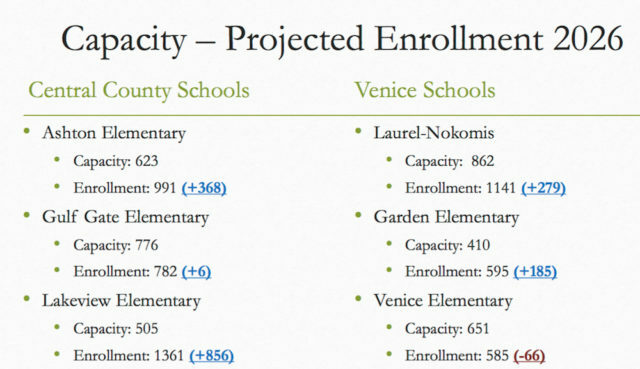 While Laurel Nokomis School is not shown in current school district documentation as having an excessive number of students, she added, a readjustment of enrollment figures already underway has indicated that it also is over capacity. After the district hired a real estate appraisal firm to identify potential sites for the new school, Ebaugh continued, the firm provided six locations. Four were on Border Road in Venice, one was on Honore Avenue Extension and the final one was east of State Road 681 and southwest of Honore Avenue. The district’s site selection committee members — which included the principals of Ashton and Laurel Nokomis elementary schools — were unanimous in choosing the location she was presenting to the board that day, Ebaugh said. They felt it was centrally located in the area where a new school was needed to serve students, and the property “had the fewest environmental or other concerns” of all the parcels on the list. Ebaugh also pointed out the property will be part of a residential neighborhood; the owner already is working with Sarasota County staff on the approval process for the development. According to the terms of the approximately decade-old interlocal agreement governing school property purchases, Ebaugh continued, two appraisals were necessary. That agreement also calls for the School Board to pay no more than the median of the numbers. The average of them is approximately $4 million, she noted. A document she had provided the board showed one appraisal — by the Hettema Saba firm of Sarasota — was $2,670,000, or $100,000 per acre. The second — by AAG of Tampa — was $5,375,000, or $201,311 per acre. Ebaugh then explained that the property owner originally offered about 26.7 acres of land to the district for $3,250,000, which averaged about $121,000 per acre. However, staff explained that all the district needed for an elementary school was 20 acres. As a result, she said, the property owner indicated a willingness to sell the land to the School Board for the $2.5 million the board had allocated, which averages $125,000 per acre. Staff wanted to make sure the School Board approved of the site before beginning the formal negotiations, Ebaugh pointed out. Even before she saw the recommendation in the material Ebaugh had provided in advance of the meeting, board member Shirley Brown said, her first thought was that the site the selection committee ended up choosing was the best one. Deputy Superintendent Scott Lempe explained then that utilities are not available on the site, but they are expected to be in place by the time construction would begin. “That will be part of our formal contract that we would bring to you,” Ebaugh added. 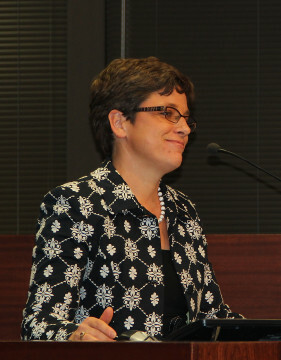 In response to a question from Brown, Ebaugh acknowledged that the School Board used to own property in that vicinity. In years past — before that land was sold — the board had planned to build a new school transportation structure there. In fact, Ebaugh noted, staff members who had been with the district for a number of years had told her, “ ‘Oh, we could have had that a long time ago,’” when they learned of the location of the recommended new elementary school site. Brown also asked about the makeup of the site selection committee. Ebaugh and Lempe explained that the interlocal agreement among all the municipalities, the School Board and Sarasota County dictated the types of representatives who would serve on it. Brown complained that no parents or teachers were among the members. That interlocal agreement is scheduled to be updated next year, Ebaugh added. At that time, she said, school district staff can suggest the inclusion of parent representatives. However, Lempe cautioned, “Changing that [agreement] is a fairly laborious process” because of the multiple governmental bodies involved in the discussions.